A charismatic villain named Dobermann leads a gang of depraved henchmen in a world of crime, drugs and endless violence. The gang boldly pull off a blood-soaked Paris bank heist in broad daylight under the noses of the police. Ruthless police officer Sauveur Cristini takes the law into his own hands and makes it his mission to stop Dobermann by any means necessary. And if you're looking for more plot then you're out of luck. Dobermann is an ultra-violent live-action comic book of a movie, one that has developed its own cult following but probably has as many vocal detractors as it does fans. Starring the cooler than thou French husband and wife team Vincent Cassel (Black Swan, Irreversible) and Monica Bellucci (Irreversible, Shoot 'Em Up) and directed by Jan Kounen (Coco Chanel & Igor Stravinsky), Dobermann is a visually stylish, amoral and supremely violent action movie laced with the blackest humour. 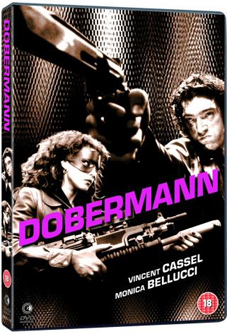 Previously released on UK DVD by Tartan, Dobermann is to get a re-release on 25th April by Second Sight at the RRP of £15.99. The disc apprears to be devoid of exra features.